Onyx is a software tool that enables customization features for Mac OS X and other options that are installed in the system but the settings maybe hidden or not. You donâ€™t need to be a technical expert in order to use the application, knowing that this is a Mac program and comes with an easy to use interface. Get to know more about this application and see what it can do to your Mac system. Onyx is a software utility programs that has a lot of function and works well for Mac OS X. This allows the users to change the Startup Disk and the System file structure. This also allows the users to change the system maintenance tasks, configure the settings on Finder, Dock and other applications installed on Mac system, remove cache, files and folders. Aside from it, it can run the Unix utilities as well, animated background for the desktop and also disable applications such as Safari and iTunes. However this application works on Snow Leopard versions and not on older versions of Mac OS X. Generally the Onyx utility tool with its new version will show some bugs that have been corrected, improve the deleting of fonts cache, improved also the deleting of log files, updated more compared to the older versions, and restores the default options found in the Parameters pane. It has lock and unlocks Dock Icon, enables and disables the iTunes application, enables and disables the ripple effect for new widgets and even deletes the recent items faster and easy. Thus Onyx is a recommended application when it comes to routine maintenance for your Mac system as well as tweaking the interface of your computer. This is also a freeware utility that works just like Cocktail and helps you tweak the interface and performance of your Mac computers. This is a multifunctional utility that works everything from checking your SMART status and changing the settings of Dock, Finder, Dashboard and other Mac applications according to your preferences. Appearance: This deals with the GUI looks and allows you to disable and enable other features in the application. You can change the appearance of the scroll bars, screen capture files, animation effects and others. 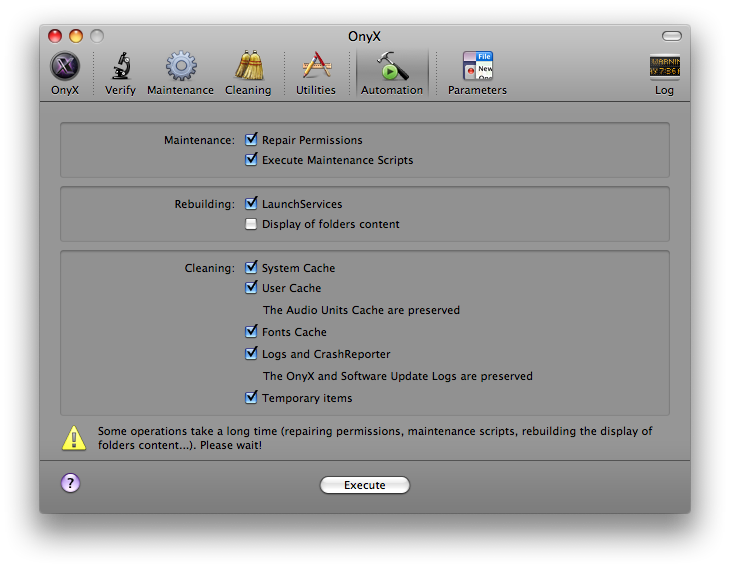 Maintenance: This controls the maintenance tasks that can be done automatically and already built in the Mac OS X. This can repair the permission settings on Mac OS X as well its classic settings. This also works for system optimization that is run usually after new software is installed. Cleaning: This show all the temporary files, caches, logs and other items that tend to clutter in the hard drive. With a simple tick from the interface, everything is cleaned easily. With Onyx, all the needed utilities for your Mac system routine maintenance are already provided for you in just easy tick and click from the application interface. It comes with simple interface that allows you to tweak the performance of your Mac system and even performs automatic routine maintenance tasks to your system.